Naples attraction-guides.com - Naples, Italy attractions guide Naples Catacombe di San Gennaro, Catacombs information about attractions, historic corridors, tombs, chambers, excursion, open hours, admission charges, location and address, tel / telephone number, general tourist information about Catacombe San Gennaro in Naples (Napoli) area, Italy (Italia) IT - Last updated 30/10/2012. The Catacombe di San Gennaro, nearby Naples, are interesting catacombs. Containing are a mixture of historic corridors, tombs and arched chambers, the Catacombe di San Gennaro are supported by stone columns. The Catacombe di San Gennaro date back around 2,000 years and attractions include ancient mosaics and early frescoes. It is also believed that San Gennaro was buried in these catacombs. 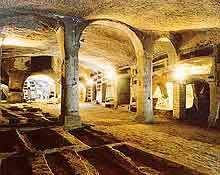 The Catacombe di San Gennaro are a popular excursion from Naples and can be easily reached from Naples city centre.